We are delighted to announce the publication of our latest report (download here) for the Social Mobility Commission in collaboration with Education Datalab. It explores how ethnicity, gender and poverty interact to support or constrain young people’s social mobility. It is unique in exploring the ‘intersectionality’ of these different factors and in using brand new analysis of the National Pupil Database to identify trends, before providing a comprehensive review of the evidence on what gives rise to these trends. Young people from black and Asian Muslims communities are more likely to be unemployed and face social immobility later in life than working class white boys despite doing better at school, according to new research by the Social Mobility Commission. The report, which uncovers stark differences in the educational and labour market outcomes of different groups in society by ethnicity and gender, prompted the Commission to call for renewed efforts to uphold the British social mobility promise that working hard should be rewarded. 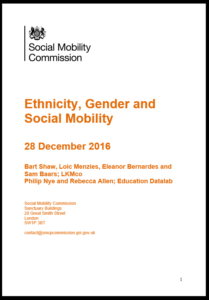 The ‘Ethnicity, Gender and Social Mobility’ report was commissioned by the Social Mobility Commission with research carried out by academics from LKMco and Education Datalab. It examines student’s trajectories as they progress through the early years, primary and secondary, through to sixth form and university. Finally, it looks at how attainment at school translates into the labour market. The report supports recent findings that poor white boys perform badly throughout the education system and are the worst performers at primary and secondary school. It also finds that black children, despite starting school on a par with their peers from other ethnic groups, are most likely to fail maths GCSE, have the lowest outcomes in science, maths and technology A-levels, and are the least likely ethnic group to achieve a good degree at university. Black boys face extremely high levels of school exclusion and overall do substantially worse than their female peers. But it is disadvantaged young people from White British backgrounds who are the least likely to access Higher Education, with only 1 in 10 of the poorest attending university, compared to 3 in 10 for Black Caribbean children, 5 in 10 for Bangladeshis and nearly 7 in 10 amongst lowest income Chinese students. Despite this, ethnic minority groups experience higher unemployment rates compared to White British groups. The research uncovers a broken social mobility promise for Asian Muslims, particularly women. Young people from Pakistani and Bangladeshi backgrounds are more likely to succeed in education and go to university. But they are less likely to go on to find employment or secure jobs in managerial or professional occupations. Pakistani and Bangladeshi women earn less than their counterparts from other ethnic minority groups. The report finds that parental expectations and engagement – such as involvement with schools, support with homework and investment in private tuition – play an important role in explaining the high attainment of some ethnic groups. Poor white British families tend to be less engaged in their children’s education than other ethnic groups, and this may play a role in explaining attainment gaps at school. In the workplace, the researchers find that factors such as geography, discrimination and cultural expectations may explain why some ethnic groups – particularly Asian Muslim women – do not do well in the labour market despite performing highly at school and university. The Rt Hon Alan Milburn, chair of the Social Mobility Commission, said: “The British social mobility promise is that hard work will be rewarded. This research suggests that promise is being broken for too many people in our society. “It is striking that many of the groups that are doing best at school or improving their results the most are losing out when it comes to jobs and opportunities later in life. “It is deeply concerning that poor white British boys are doing so badly in education, from the early years through to university. Yet they are less likely to be unemployed and face social immobility than young people from black and Asian communities, Asian women especially. “Britain is a long way from having a level playing field of opportunity for all, regardless of gender, ethnicity or background. The research contains a number of key recommendations for Government, universities, schools and early years’ providers to address the barriers faced by certain groups in society. Hi Zuhura, I’m afraid not unfortunately! Hope it’s still useful for you though?